This beer battered tofu planks recipe is actually three recipes on one page. Why? Because, grouped (or served) together they make one terrific meal! 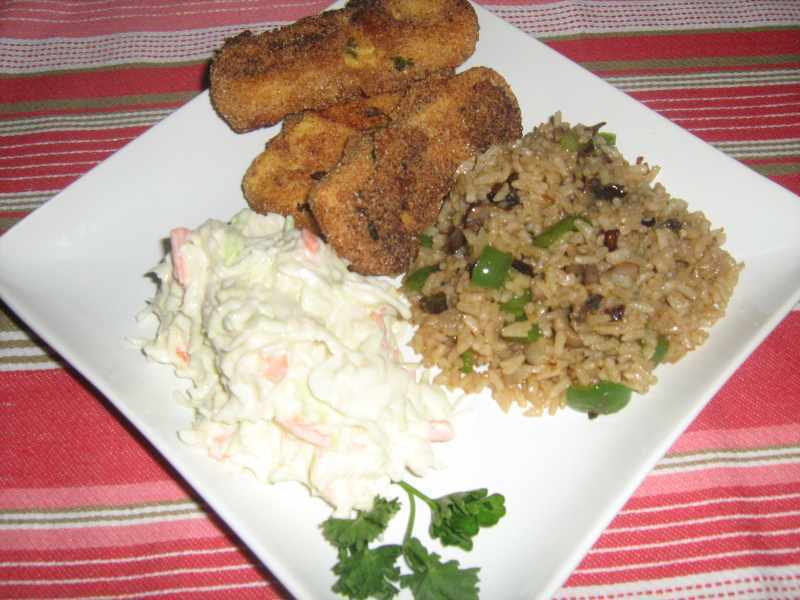 You might choose to make any one of these and serve it with something else to your liking as well, however, we thought the beer battered tofu, cole slaw and sautéd rice were perfect complements for one another. The fried batter dipped tofu is done to a perfect golden brown which gives it a light crunch on the outside. The cole slaw has just the right "edge" to it and it balances with the fried tofu perfectly. Add in the sautéd brown rice with all of its flavorful components and the only thing left to do is uncork a bottle of good wine and enjoy! In one bowl combine the whole wheat flour and the beer. Add half the flour and stir until combined, then slowly add the remaining flour until you have a thin batter. In a second bowl, combine the corn meal, paprika, garlic and onion powder and the salt and pepper. Mix together thoroughly. Heat about a half inch of oil in a medium to large skillet. The oil is hot enough to fry when a small drop of water skips across the surface of the oil. Hopefully you have a tofu press and have pressed the tofu ahead of time. If not, you will need to press it before continuing. Once the tofu is ready, slice it into thin slabs or planks, about 1/4 inch thick. You should get about 10 to 12 planks from one package of tofu. Dip each tofu plank into the batter. Allow to drip off most of the excess, then place the planks into the bowl of dry ingredients to coat with the corn meal mixture. Carefully place the planks in the hot oil and fry for 2 to 3 minutes before flipping them over. They will cook to a golden brown and have a crisp outer crust. Remove the planks from the oil and place on a dish covered with paper towels to drain off the excess oil. This is a quick, easy cole slaw recipe. Combine all ingredients in a medium to large bowl. Mix thoroughly, add salt and pepper to taste and refrigerate until ready to use. Add the vegetable broth to a medium to large, microwave-safe bowl. Place the bag of rice in the bowl and microwave according to pack- age directions (usually 10 minutes). When cooked, remove the bag, press it to drain off excess liquid and allow it to cool while you chop the onion and peppers and slice the mushrooms. Heat the oil in a skillet or wok over medium-high heat. Add the onions and cook until translucent. Add the peppers and cook for 2 to 3 minutes. Add the mushrooms and cook for 3 to 4 minutes. Finally, add the rice and celery salt, reduce heat to medium-low and cook until mushrooms and onions have browned and peppers are very tender.